Monday August 29. Returned from road trip. It was quite cool in the Stara Planina mountains, eventhough we had descended from the 7,500 feet summit on the Shipka pass to 1,800 feet in the village of Etara. I had not brought any thing but an other t-shirt. A welcome change from the 80 degrees on the coast and the plains and away from the tourist crowds here on the beaches. Etara has a center for artists who produce traditional handicrafts, wood carving, carpet dying, weaving, etc. I particularly enjoyed, as a Busman’s holiday, the old frame saw mill. Where a log saw was moved up and down like a jig saw, by a very primitive steam system. Our next stop was Tryavna, where with subsidies from the EEC, the village is being restored and the old wood carving trade encouraged. Next we stopped to see the very impressive Tsarevets Fortress in Veliko Tarnovo. It sits on a high hill on the edge of the city. It is like nature dug a giant deep mote around the hill. Because of it’s strategic and easily defendable location it was already used by the Thracians, later by the Romans. The Byzantines built the first real fortress on the hill, between the 5th and the 7th century. 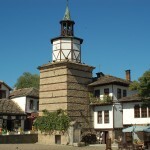 The complex used to contain the Royal Palace from where 22 successive kings ruled Bulgaria. I had many questions for Inga who has studied the Euoropean history thoroughly and loves to go on these discovery trips. My knowledge is in bits and pieces since I never studied the ancient history of Europe. By the time I am done with Turkey and Greece I should have a better picture to work with. I forgot to mention that we also stopped on Saturday night, before we went up over the Shipka Pass, at Kazanlak to take a look at the Thracian Tomb Museum. This tomb was discovered when constructing a bom shelter in 1944. Built for Thracian ruler in the 4th Century BC. Unfortunately we missed the museum closing time by half an hour. On our way up to the pass we passed several more of these burial mounds rising out of the fields. 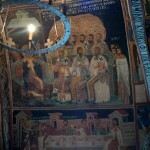 On Sunday our next stop was the town of Arbanasi. Nestled between trees, parks and crisscrossed with cobbelstone streets and sand tracks are a number of historic monuments. 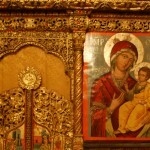 We chose to visit the Church of the Nativity. Built during the Muslim Ottoman rule in the 16th/17th century. We made it back to Sozovo before dark. I really enjoyed getting away from my river and sea side routine and observe how the rest of the Bulgarians live and treasure their history. The weather forecast has niot changed much from last Saturday and it looks like the Three Musketeers here will leave Sozovo for Tsarevo tomorrow. Sunday Aug 28. Road trip to the Bulgarian interior. This is a total change of scenery from the hot summer weather on the coast in busy seaside resorts to a cool quiet mountain village near the Shipka Pass. Our first stop was at the Neolithic Dwelling Museum in Stara Zagora. It is a small museum built over the excavated remains of Stone Age dwellings dating back to between 7 and 6 milleniums B.C. 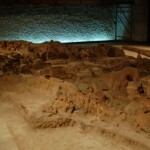 They are considered the oldest human dwellings known in S.E. Europe. Made from clay. From the picture you can make out the cooking area, post foundations and pottery and stone utensils, etc. The museum has a display of the pottery remains that have been reconstructed in their original state, some with the help of computer programs. Next we drove further north through the valley where a particular type of Damask roses is grown for the production of rose oil and rose extract for the cosmetic industry. I bought a jar of jam made from it in Nessebar, great stuff. We stopped in the villlage of Shipka to take a look at the Orhtodox Cathedral of Saint Nicholas. 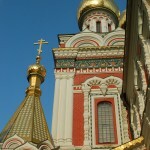 We could see it from afar in the setting sun, reflecting on its gold leaf covered onion domes. 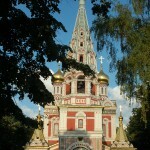 It was built in 1902 as a memorial to the Russian soldiers who drove the Turks out of S.E. Europe in 1877. Inga had this travel program all rehearsed with Christoph their Bulgarian friend in the marina. 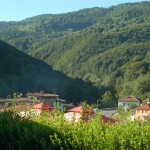 We are now staying in a small hotel in a mountian vilage. Aug 27, Saturday Morning Post. A new plan. The wind was blowing all night and this morning’s forecast shows force 5 on the coast and 6 further to the East and that is where the wind direction is coming from, this means a very rough surface condition. The wind drops to force 4 on Tuesday and will be from the N.W. which will make for a much smoother surface and the right direction to the Bosporus. So we are staying put for now. Our travel director and history buff, Inga, is right now looking for a rental car and then the three of us will be off into to the interior till Sunday evening. Possibly the condition will improve sooner so that we can leave Monday. 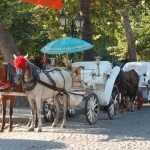 Right now my thought is to just make a short stop at Tsarevo, to check out and then keep going to the Bosphorus. 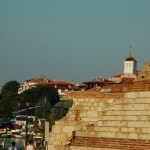 Properly propped put putted out of Nessebar yesterday morning. Nervously checking the flex coupling, packing and shaft. I had the same overheating problem and excessive drip throught the packing as at first use on the Danube, last July. But it looks like it will be the same process by adjusting the pressure on the packing till it is settled in. I have lost about half a knot in sailing speed but the response from forward to reverse is much quicker and that is an advantage when maneuvering in crowded harbors. “Stella Maris” left an hour ahead of me and they are parked next to me on the inside of the floating marina pier and ahead of them is a Toronto couple (Giovani or ) John and Roberta on “Quickbeam” a C&C 38. They made the same cruise to the Ukraine as “Stella Maris” from Turkey and are returning to the Med from here as well asnd then plan leave the boat on the hard in Rome, for the winter. 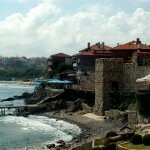 Sozopol is the oldest Greek settlement, in 611 BC, on the Bulgarian Black Sea coast. 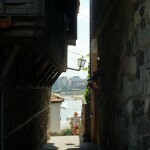 A charming town with the same red tile roofed, stone and wood houses as Nessebar. But not quite as touristy. Last night we got together on a Bulgarian day trip boat. The skipper, Christoph, also works as a skipper on large sail race boats in the Med. The races out of Sardinia, Greece, etc. 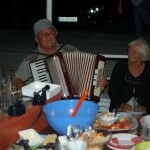 Peter a friend of Christoph, since childhood, played the accordion beautifully. He is a clarinet player in the Bulgarian Concert Orchestra. I enjoyed talking to my new Canadian neighbors. Roberta-Bobby was born in Canada right after her Polish parents immigrated to Toronto. A fascinating story about her mother who was sent as an 18 year old with her sister and brother to Siberia by the Russians, in 1939. They managed to escape from Siberia by attaching them selves to the undercarriage of a freight car and wandered through Iran into Palestine and the British occupation there sent her to England where she served in the RAF as a flight controller till the end of the second world war. There she met her Polish husband who served in the Polish expatriate army. Bobby speaks fluent Polish. And her husband Giovani came as a three year old from central Italy with his parents to Canada, he speaks Italian and the local dialect. They are giving me lots of good information for my winter’s stay in Turkey. They spent last winter near Marmaris. There is quite a contingent of North Americans there and it sounds like I will not have a dull moment there with lots of organized activities and excursions to the historic sites. 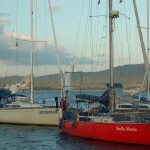 There are a number of impressive large power and sail boats in this marina. Since Bulgaria is one of the least expensive spots to get fuel, I tanked up, 45 liters. It was the first time since I left Zimnicea to get fuel and that is about the same quantity as what I then left with to motor the last 550 km ( 300 nautical miles) of the Danube plus some motoring on the Black Sea. So that comes to about 30 miles ( 35 statute miles) per gallon. The power boaters who do this against the current will be green with envy to read this. We were to get strong winds here as of last night and nasty weather till Monday. There was an increase in the wind strength, it cooled off and it clouded over but it is till quite pleasant. I had understood that this was the last port to clear out of Bulgaria from but that turns out to be incorrect, there is no customs/immigration here. 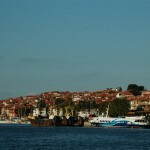 I plan to leave tomorrow with “Stella Maris” for Tsarevo, 20 miles further on the Turkish border. I sanded out the cavities that I had filled, yesterday, with epoxy. And the fixed prop is installed. It turned out to be a more difficult act to get the heavy shaft lined up at the right angle, under water, and pushed in. But I succeeded. Wolfgang came out to help me this morning but at the first try it did not work. Martin the Dutch speaking Bulgarian diver, pushed it through the last 8 inches while I pulled the plug out inside the boat and inserted the new packing gland strips. Tomorrow I’ll get to test the new set up. I am curious how it compares to the folding prop performance. 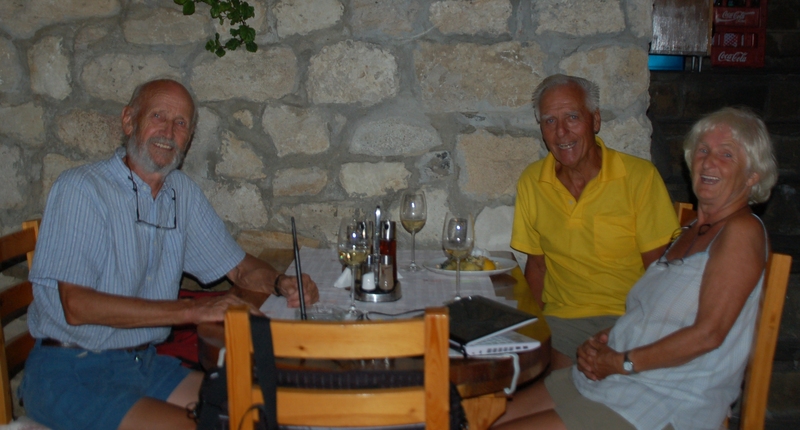 Inga and Wolfgang took me to dinner to a nice Nessebar restaurant, this evening. Very nice evening and excellent food and company. I could spend the next couple of years and listen to their travel and cruising stories. 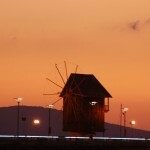 We’ll bot take off from here tomorrow to sail the 20 odd miles accross the bay to Sosopol. That will be my last Bulgarian port, before heading to Istanbul. It sounds like a good stop to make. The old spare fixed propeller has been mounted on the shaft and the shaft was checked for straightness and it passed. I filled the scratches and electrolysis cavities with epoxy. Tomorrow she goes back in and then I plan to leave here on Thursday. 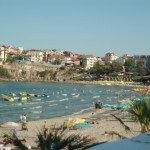 I plan to make one more stop in Bulgaria at Sozopol before heading for the Bosporus. That is just a 20 mile run across Burgas Bay. Inga and Wolfgang of “Stella Maris” talked me into it and they will head the same way. They arrived this afternoon from Varna. I cooked dinner for the three of us. These two have seen more of the world than any one I have ever met before. They were in Iraq in the late seventies, China in 1981 when it just opened up, etc. etc. They rented a car last week to travel up to Romanian Transylvania. I got a haircut, did laundry. Talked to Gerrit for an hour or so on Skype. My last hope for being able to use the remains of the folding propeller with the blades of another one for sale in Holland, were dashed this morning, when the dimensions turned out to be too far apart. So, I am having the marina here check the shaft for proper allignment and if needed have a new shaft made up and then mount my spare fixed prop. I should be on my way again by the end of the week. I finally have figured out how to get on line in the marina, from the boat. I was using the enter key after I put in the user name and password. I needed to use my mouse to hit the “ok” key. This saves the walk into town and the consumptions at the wireless cafes. I changed the oil for the first time on the new engine. So much easier, quicker and cleaner than on the old Renault. But the dip stick and the filter are torture to get at. My neighbors with the floating stadium speakers are gone for the night, I hope, so that I can sleep without their parties that start at midnight, when they drag in their female catch for the night, and last till sun up. Saturday Aug 20. I got the Shaft.. I had contacted the place I had bought the Flex coupeling from, but did not get the wiser about my disassembly problem. Then this morning I received an answer from the company that sold me the new diesel engine. Bingo! I needed to screw three bolts into the face of the coupling, to disassemble. I never received any instructions with the purchase, they e-mailed me later a shortened set of instructions on a similar coupling. But no where was I to know about these three bolts. They did not come with the purchase and I fortunately found the right size for them in my dungeons. I could have saved at least 15 hours of hard work and two divers working on it as well for a couple hours. Anyway. I am happy. I also managed to get the old packing out while I pushed the shaft out. Water gushed in and it was a delicate operation but I got the plug in and now I can get on with the replacement. I will double check the shaft allignment. I shall make one more effort to see if I can find a folding prop and or a replacement for just the blades. Otherwise it will be the old fixed prop. 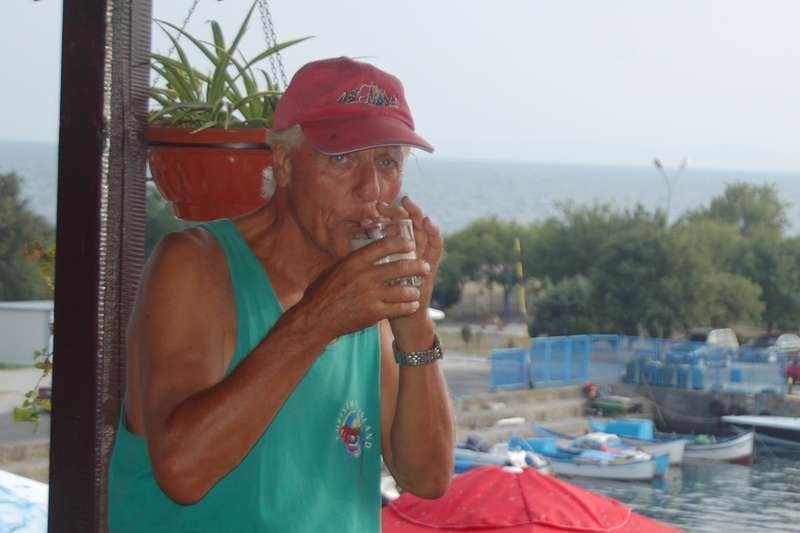 Wolfgang and Inge of “Stella Maris”, who I met in Constanta, are on their way here. I am looking forward to their company. 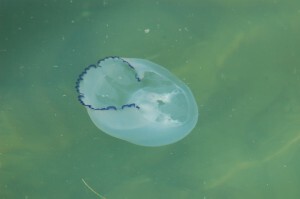 another type of Sea Nettle. Friday August 19, I could be marooned in a worse spot. Option B is to mount my fixed prop. But it now turns out that this marina has no good cradle available to hoist me on to. One of their men, with his diving gear, tried for over an hour to pull the shaft, but it would not budge. The rubber flexes but is firmly fused to the shaft. I can get the boat lifted at the other marina but their shore property is in the high rent district of the closest parking lot to the town and that starts adding up fast. It is still a total mystery to me how these flex couplings work and why it does not come loose. I hope to talk the marina people here into lifting with the mobile crane and keep me in the slings with the keel to the ground and then have an automotive axle/hub puller at the ready to try and wrestle the shaft loose. Then the boat can go back in the water and push the shaft back in after we have mounted the propeller replacement. This evening I decided to forego cooking my own dinner. I had a shrimp appetizer and lamb. This is definitely a great place to have a vacation. Today I talked to a couple young ladies who sail the Olympic Class 470 dinghy. They had competed last year in Scheveningen and knew Marieke Jongens, the daughter of Cees Jongens who has just returned from a circumnavigation, which included Nhatrang Viertnam. Where “Fleetwood” visited in 2006. I met him last summer in his home town, Hoorn. The Bulgarians were Janna and Eva, they knew some Dutch. Real dolls. I posted a manuscript to Crusing World today about the Danube voyage. I hope they like it. From a comment today on the blog I learned that a fairly well known advertising consultant/web guru in Holland, Themelis Cuiper, recommended reading my site. I am flattered. Wednesday August 17. Nestled in Nessabar. I am pursuing several leads for a propeller replacement and I am still searching for solutions on how to dislodge the fused flex coupling. “Kirsten Jayne” with Keith and Carol sailed away this morning for Burgas. So, I am once again the only foreign sailboat visitor. 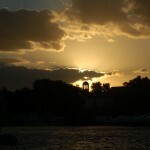 I have finished an article about the Danube journey that I plan to flog to the USA. The below picture was taken for the N.W. Sailing magazine “48 North”. This is to get me a new hat when I call in Seattle, or maybe one of you can come bring it to me. The weather has been outstanding and I am anxious to get on my way to Istanbul.